It seems like I’m blogging about Open Space with regularity nowadays. Awareness of the technique is clearly growing amongst the campaigning NGOs and networks with whom I do a lot of my work. And it’s being used to good effect. Of course it’s a far from perfect methodology and some of the issues were touched on in the first part of this post. I’m hoping to bring you a fuller critique of Open Space sometime soon. In the meantime, Open Space was in use at the Climate Camp gathering in Manchester on Saturday and at People & Planet’s Shared Planet conference on Sunday. Rhizome was able to offer a little phone support to climate camp folk on how Open Space might work in the context of their meeting. I was at Shared Planet on Sunday giving more direct support to Beth from the People & Planet staff team who was facilitating an Open Space that day. 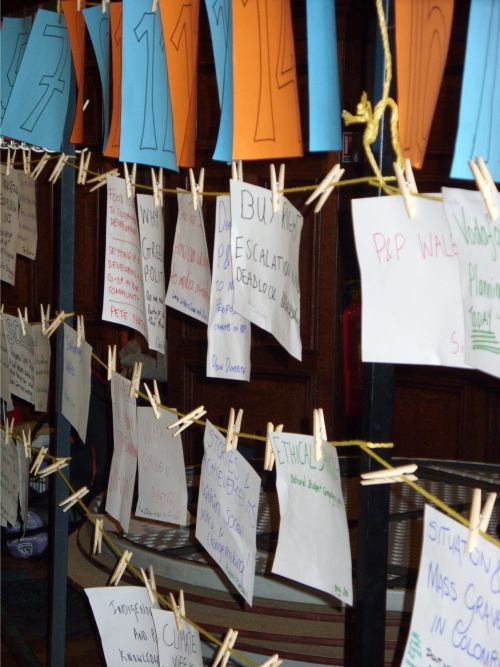 When P&P first asked for support we outlined a number of possible options, from facilitating the day ourselves, to training them to do so, to the option they finally chose: training P&P staff as Open Space facilitators and offering ongoing support by phone, email, and in person on the day. On Sunday, my role was to troubleshoot, help physically set up the space, and offer Beth any support she needed. On the morning this amounted to getting on with co-ordinating the physical set up whilst she found herself time to grab a coffee and sit and rehearse her opening spiel. Once she was ready, we walked through her spiel to fine tune it. I’ll speak with her later this week to debrief the opening of the space This model of support is very satisfying. It would have been easier (and cheaper) for P&P to simply ask us to facilitate the day, but instead we transferred the skills to their staff team, and were able to help consolidate them through the ongoing support. On a more random Open Space note, P&P opted for 20 breakout spaces. 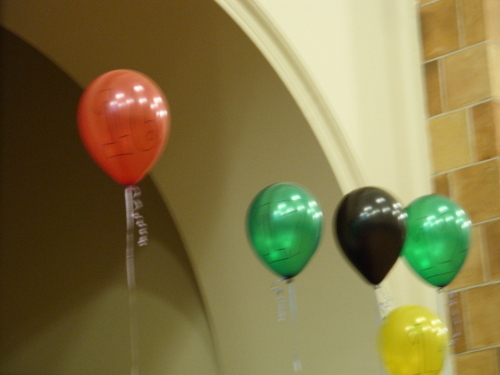 The venue (the rather grand Aston Web Great Hall at the University of Birmingham) wouldn’t allow us to affix anything to the walls, so someone had the ide of using helium filled balloons tied to chairs to mark breakout spaces. Perhaps not the most eco-friendly option, but it made me smile and served its purpose well. Although breakout space number 20 did pop…..